This manicure took a really long time to complete and required quite a few polishes! The firework colors include Sally Hansen Grass Slipper, Lacey Lilac and Blue Me Away!, Kleancolor Neon Pink and Neon Yellow, and L.A. Colors Sea Siren (pictured left to right in the last photo). I tried this look out a couple of different ways, with lots of fireworks per nail, and with just a few per nail, but I like both ways, I don't know which I like the most! It's just so colorful and fun!! I used Sally Hansen Co-Bolt Blue as a base, with two coats of Pure ICE Strapless (blue glitter), then sponged L.A. Colors Glistening Purple and Treasure Island. About two weeks ago, I mentioned that I had gotten a set of e.l.f. polishes (and showed you Red Velvet) and Metal Madness was also in the set. This is a really gorgeous grey almost-metallic shimmer with sparse bits of holo glitter. It was surprisingly opaque in one coat, but took a century to dry, so after 10+ minutes of waiting, I just applied a quick dry top coat. I have no idea how long it would take to dry on its own, but it was still pretty tacky and smooshy after the 10 minutes. Knitting scarves? I make at least one new one every winter for myself and some for friends and family. Knitting blankets? Yep. those too. Sewing? I have more quilts, pillows, and started but unfinished quilts and pillows than I will ever know what to do with in my lifetime! (Not including the Indian-themed and Elvis-themed ones I have my for my mom). On Thursday, I showed you a franken that I made with L.A. Colors' loose eye shadow called Treasure Island. I never can leave a plain polish alone, so I decided to use L.A. Colors Sea Siren to stamp on top of it (BM 221). Then I did the same stamp, slightly to the side of the first, on top of that in white with NYC French White Tip - it's not too opaque so it gave the stamp a slight two-toned look in some places, which I prefer to a more opaque white in this look - and finished with a free-hand french tip of Sea Siren. 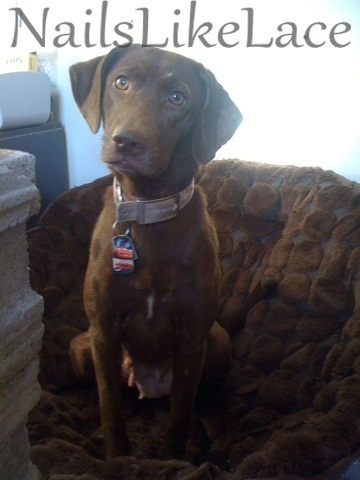 For my first Furry Friday, this is the "princess" of the house, Nikki (my husband's chocolate lab). The white base is NYC French White Tip, the blue glitter is Strapless by Pure ICE and the blue bottle shown that the snowflake is done in is Sally Hansen Blue me Away!. I was awarded the Liebster Award by Taylor from Simply Beauty. Thank you so much! This is my second attempt at watercolor nails. My base is NYC White French Tip with NYC Pink Promenade, Sally Hansen Lightning and Sally Hansen Blue me Away!. The accent nail is done with NYC Classic Coral and a sticker I got off of eBay. 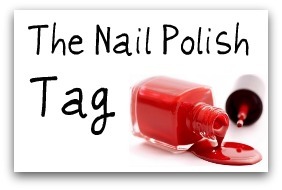 You start out with a white base and apply a thick layer of top coat on top of that. Then place a couple of dots of your first color. I used NYC Big Apple Red. I first saw this polish on Polish and Charms a while back and really really wanted one of my own! However, I looked through every single Hard Candy bottle and came out empty-handed every time. What do you think? I haven't able to fix the wonky adjustments on the dashed, vertical, dividing line to get things away from it in the left sidebar, nor the part at the top of the header where the brown border just cuts off in the middle... but it'll do. 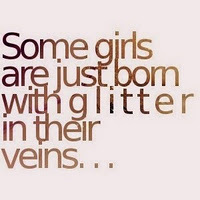 - Pass this on to 4 more Glitterati. 3. Make sure that the bloggers you tagged know about this. So I watched 3 episodes of some show the other night where they showed off ridiculously lit up houses done by Christmas light-enthusiasts in the U.S. and Europe. So I was inspired to do this look. This design was semi-inspired by a Robin Moses design in which she did a sort of french tip of presents with Snoopy and such. I really liked the french of gifts and decided to try it out. You can see her video here. I used Sally Hansen Diamonds as my base and mixed acrylics for the presents, candy cane, tree, stocking and snowman.